Full of flavor – Chefs use herbs to add flavor to their recipes, just like we did with the Awesome Apple Stuffing recipe in the November Gobbling Good Fixings Kids Cooking Kit. 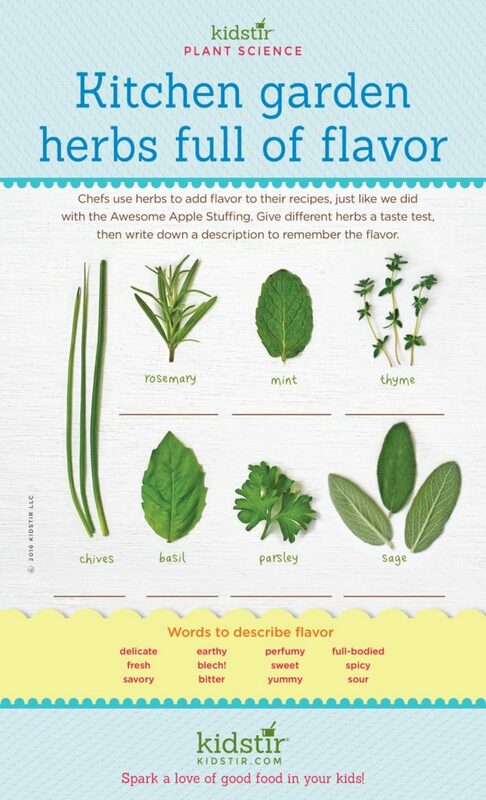 Give different herbs a taste test, then write down a description to remember the flavor. Here’s a list of popular herbs and some words you might use to describe their flavors. See if you agree or write down your own taste descriptions and match them up. Keep adding to the list of herbs and flavors to create a handy guide to help you cook with the right herbs for your taste. delicate, earthy, perfumy, full-bodied, fresh, blech!, sweet, spicy, savory, bitter, yummy, sour. 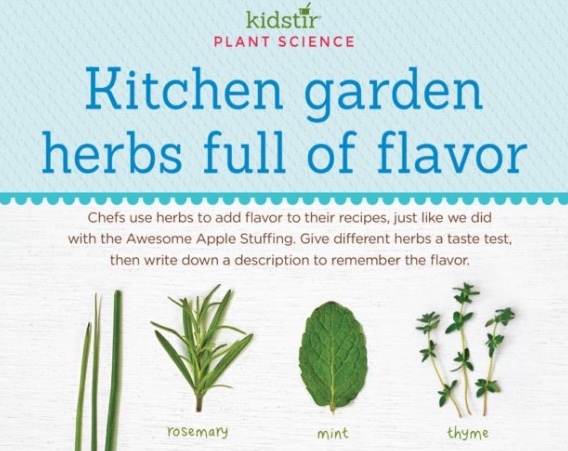 We’d love to offer this Kids Garden Herbs Infographic for you to share on your blog. Just select and copy the code snippet below and paste into your next blog post. We’d love for everyone to share this page on social media or email using the buttons below so all the kids you know can have fun growing and cooking with herbs throughout the season!